Syrian government and opposition representatives have met briefly face to face in Geneva in what is being hailed a small but significant step in talks aimed at “saving Syria”. The initial gathering in Geneva lasted half an hour mediated by the UN’s Lakhdar Brahimi. Delegates in Geneva are aiming at small concessions, not a full peace deal. “Ending terrorism and violence” is the top priority, Syrian officials say. They insist it is too early to discuss President Bashar al-Assad’s position. The two delegations filed in through separate doors into one room in the UN Geneva Headquarters, and sat down at the same U-shaped table, but said nothing to each other. Lakhdar Brahimi spoke for half an hour. Then they all filed out again. Ahead of the next face-to-face meeting, Lakhdar Brahimi will shuttle between the delegations, trying to build confidence with small achievements like localized ceasefires, release of detainees and the opening of humanitarian corridors. There is hope that minor progress will pave the way for the discussion of wider issues like political transition next week, although there has been no sign of common ground on this so far. 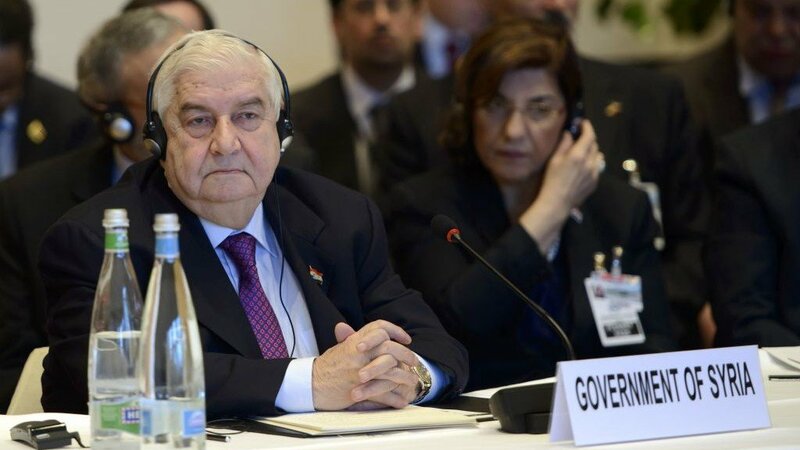 Shortly after the initial meeting, the chief of staff to the leader of Syria’s National Coalition, Monzer Akbik, claimed that the transition process had started in earnest. However Syria’s Ambassador to the UN Bashar Jafari – part of the government delegation – said it was “too early” to talk of President Bashar al-Assad stepping down and that the issue was “not the priority”. “Item number one should be putting an end to the terrorism and to the violence,” he said. The envoy said the common ground between the parties “should be that we should talk about everything, everything, without any selectivity… and no preconditions and no hidden agendas”. But he accused the coalition delegation of harboring “personal hatreds towards the government for whatever reasons”. The opposition and government are fundamentally divided over the aims of the conference. The government delegation has said the main issue of the talks is finding a solution to foreign-backed “terrorism”, by which it means the whole of the armed opposition. The opposition, however, had insisted that the regime commit in writing to the 2012 Geneva I communiqué, which called for a transition process. The communiqué urged Syria to form a transitional governing authority that “could include members of the present government and the opposition and other groups”. Syria’s civil conflict has claimed well over 100,000 lives since it began in 2011.